From the moment you enter the gates of Fota Island Resort, you will be struck by the sheer elegance and natural beauty of a place where life runs at an altogether more leisurely pace. You will drive on tree lined avenues where magnificent oaks and sycamores herald your approach. And when you reach your destination and step from your your car, you will find your greeting laid out before you in the tranquil setting of your exclusive lodge. 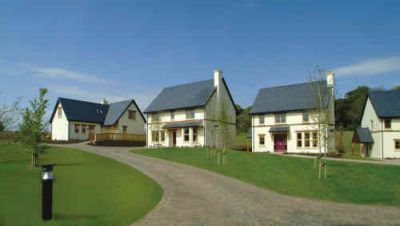 Set in the heart of the unspoilt East Cork countryside, and yet a mere fifteen-minute drive from the city itself with its bustling streets and international airport, your lodge occupies a place like no other – combining the perfect blend of luxury, tranquillity and convenience. Step inside your exclusive lodge and surround yourself in luxury. Underfoot the solid oak flooring radiates quality and strenght, while the oak panelled doors with their elegant walnut inlay provide the reassurance that every design detail has been tastefully and carefully considered in the crafting of these homes. From the traditional to the contemporary the balance is exquisite. In addition to the superb accommodation the lodges offer there are a host of on site facilities to avail of: Guests can eat and drink in the opulent Sheraton Hotel which has two excellent restaurants and a bar, enjoy a round of golf in a spectacular location or relax and be pampered in the on site treatment rooms. The resort also boasts a swimming pool (children may enjoy the use of the pool between the hours of 9am-11am & 4pm-6pm every day but other times are restricted for use by adults only). These superior 2 bed courtyard lodges sleep 4 and the accommodation comprises of 2 double rooms and spacious open plan living area. Each beautiful lodge is completed to a five star standard. Three and four bed course side lodges also available. Please contact our reservations team for information on these properties. From Cork to Take the N25 in the direction of Waterford & Rosslare. Take Carrigtwohill/Cobh exit. Take the R624 in the direction of Cobh. Fota Island Resort is approximately 1km on right. From Waterford – Take the N25 in the direction of Cork. Take Carrigtwohill/Cobh exit. Take the R624 in the direction of Cobh. Fota Island Resort is approximately 1km on right.